On September 10, 2017, Hurricane Irma created a whirlwind of chaos for Collier County. Governor Rick Scott took his position behind the podium, and he created a sense of calm for many, in the face of hasty evacuations or limited shelter-in-place preparations. As someone who couldn’t afford to be offline – I’m on several deadlines for various projects working for clients in other parts of the world not affected by a natural disaster and depending on me for their paycheck – I booked a hotel in New Orleans, packed a bag, and in a fit of tears and tantrums, forced my husband to drive me three states away. We had just returned from Key West that Monday, and finding ourselves in the midst of another journey, I couldn’t imagine weathering any storm without Simon’s positive strength and support. He calmed my fears and kept me focused on the present moment. The other side of the hurricane was uncertain, but he told me my home would always be in his arms, and that’s where I was and where I’ll stay for as long as he’ll hold me. We returned on Wednesday to find out that while we would be severely inconvenienced through the power outages, house and pool cage damages, and gas shortages, an inconvenience would be the maximum level we’d need to face. Parts of our county are devastated. Places we visit often are devastated. …and I can’t even wait to get back to the Keys and start supporting their economy again. Cheeca, Hawks Cay, La Concha… Lorelei, The Commodore’s Boathouse, Jack Flats, Sandbar Sports Grill, Joe’s Tap Room… Irish Kevin’s! Many people will never return to the lives they once led. That, to me, is terrifying. Starting over is terrifying. Uncertain futures where new goals and dreams have to be created is terrifying. Stay active on social media to Like, Share, and Comment on posts where reliable people are seeking assistance or offering aid. Donate money. The government will help, but the devastation was wide-spread throughout several states and funds are disbursed to those who have access to request the money and bank accounts to receive it. Not sure where to donate? Support a Go Fund Me campaign, like this one: https://www.gofundme.com/886c9-marco-island-hurricane-irma-fund. Do you have cash at a gas station that accepts only cash? Pay for yours and someone else’s. If they thank you, ask them to pay it forward one day. Does your refrigerator have an ice maker? Do you have electricity and water? Do you live locally? Put your ice in Ziploc bags and deliver to people who don’t have electricity, as many stores are still recovering and selling out of ice quickly. If you can help support Captain Ron Hagerman of Captain Ron’s Awesome Everglades Adventures in any way, if you know any media outlets, if you can post his press release on your blogs, if you can share his story… please do so. Disasters like Hurricanes Irma and Harvey are stunning examples of the raw power and force of Mother Nature; something no one human or organization is prepared to face alone. Knowing the need for relief on Marco Island would be great as Hurricane Irma tracked its way towards the southeast seaboard, long-time resident of Marco Island, Capt. Ron Hagerman of Capt. Ron’s Awesome Everglades Adventures, jumped into action. “I was in Texas doing rescues for Hurricane Harvey when I had to leave to prep for this one. I took what I learned there and improved on it with the best group of men and women. I knew too many were going to stay on the island so we prepared in advance for the worst,” Hagerman said. Thus, the birth of the Marco Patriots: a group of volunteer civilians who banded together in time of great need to help the citizens of Marco Island. The efforts of the Marco Patriots were established and organized by Hagerman and others. The group began a Zello channel to institute a communication line. This was quickly followed by a Facebook group to share information. At its peak, the Zello channel held over 300 members and the Facebook page over 7000. Marco Patriots “command”, Mark Melican worked to collect contact information from all residents who decided to stay in their homes for the storm. Through these lines of communication, Melican and others were able to organize hurricane preparations first. This included volunteers going to the homes of others requesting supplies (plywood, tarps, concrete screws, etc.) to secure their homes. It also included following up with reported elderly residents who needed assistance in preparations. As the list of residents grew, the Marco Patriots established a database system to track addresses, number of occupants, medical needs, those without proper supplies and contact information. Addresses were mapped using the app, Google Maps. First responder volunteers set up “location sharing” within the app to allow the Marco Patriots command and administrative team to monitor their whereabouts throughout the storm and emergency calls. Marco Police and Fire Departments both reached out to the Marco Patriots for access to their database, maps and first responder GPS procedures. Information was also shared with the Cajun Navy in the event of the lead Marco Patriots group members losing communications. Fortunately, all members were able to remain connected via Zello during the entire storm. As the preparations wound down and the storm began to come onshore, the Marco Patriots utilized the Zello channel to remain in contact. Those of the team who were not physically on Marco were able to provide real-time updates to all listening such as, when the eye of the storm was hitting, when the storm surge was incoming and when it was safe to start doing wellness checks on the registered elderly or infirm. The level of knowledge and compassion displayed by Marco Patriots members during this time of crisis was immeasurable. During the eye of the storm, Patriot member Erin Milchman could be heard saying over Zello that her roof was going to give and location was no longer safe. Patriots immediately rushed to her aid by locating the closest occupied house where she and her family could take shelter. Erin and family were able to evacuate and get to the house of Tony “Smudge” Smith safely before the back half of the storm hit. Additional recommendations were shared for residents to get to higher ground where possible as the predicted 10-15’ storm surge was thought to be approaching. Although flooding on the Island did occur, residents were lucky the waters did not come as high as predicted. In the aftermath of the storm, rescue and well checks immediately began. Within minutes of the worst of the storm passing, Marco Patriot first responders in conjuction with Command and Administrative team were able to begin wellness checks on residents marked “critical” in the database (those with extreme medical needs, elderly alone, etc). The Marco Patriots First Responders team included: Capt. Ron Hagerman, Matthew Melican, Steve Camposano, Tony “Smudge” Smith, Uncle Jeff (need real name), Joey Waves (need real name), Josh Eiler, John Rossi and Capt. Steve (last name), Kerri G. Command and Administration team include Mark Melican, Erin Milchman, Kate Weaver Younger, April Greeson & Kayley Whitworth. Prior to the storm, the Marco Patriots database contained 198 registered addresses accounting for 458 residents. Within 24 hours, 110 properties and the safety of 278 residents were checked. Additional checks were completed by numerous other volunteers as requests poured in from friends and family registered on the Facebook page and Zello channel. Within 48 hours, volunteers were also able to field numerous “well house” checks letting out of town evacuees and residents know about the conditions of their homes as they continued to work on wellness checks for residents. As emergency rescue calls on Marco Island subsided, the focus of the group shifted on September 12 to organizing supplies for the residents of Everglades City and Chokoloskee, two locations removed from the city and in need after the storm. Due to their location in the Everglades and flooding in the area and surrounding cities, supplies such as food, water, diapers, and gas were in short supply. Despite still needing many of these items themselves, Marco Island residents once again banded together to help their fellow men and women. Donations of water arrived within minutes of the call for help and gas was collected by siphoning from water craft not being used. Capt. 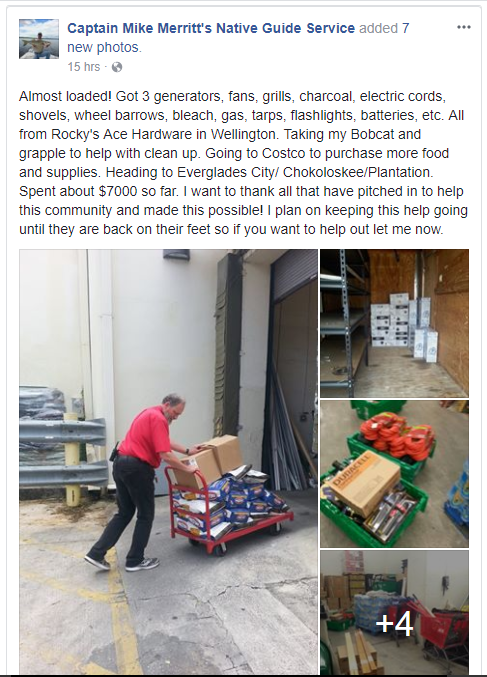 Ron worked with the Marco Police Department to obtain a curfew exemption and made two separate trips to Chokoloskee bringing supplies to those in need. “When a man is willing to eat an MRE [Meal: Ready-to-Eat] you know he needs food. I was compelled to go back a second time with more supplies as soon as possible,” Hagerman said. These are just some of the ways I’ve noticed people helping people. The world needs more love, and a natural disaster is a sad way to achieve that, but it is uplifting to know that so many are out there doing even a little bit to help steady the chaos and rebuild the community. Do you know other ways to help? I’m sure there are waaaay more than eight! Post a comment and share what you know. Thanks!!! Want to help share my 8 Ways to Help After Irma blog post? Copy the Tweetable below and paste all over social media. As always, thanks for taking the time to read my blog! Thanks for finding me.